I would like to share the second port of call on our anniversary cruise. Hope you enjoy. Dubrovnik, Croatia July 28, 2010. I loved Dubrovnik. From a scenic view point, we had a magnificent view over Dubrovnik and its Riviera. 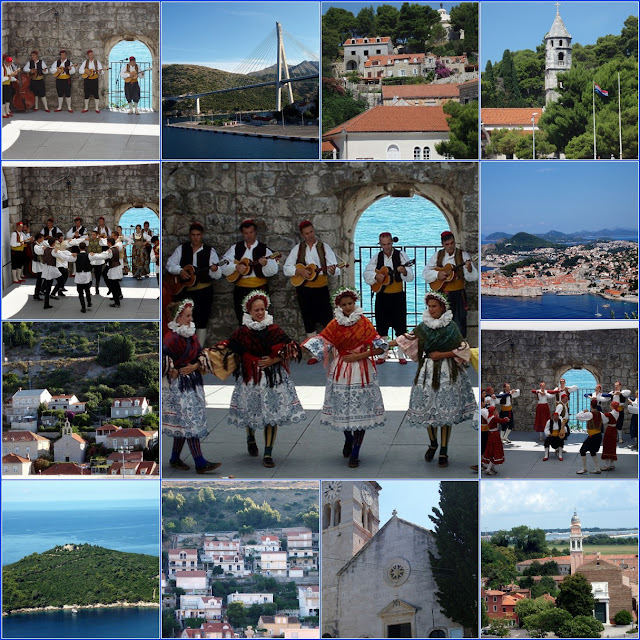 We had a pleasant drive along the coastline and through the picturesque villages of the green and fertile Konavle valley. We headed to Cavtat, with a palm-lined seashore and numerous cafes. We walked along the beautiful seafront promenade. At the eastern entrance to the Old Town in Ploce Square we stopped for refreshments and watched a performance that included regional costumes, songs and dances from various Croatian provinces. After the performance we walked from Ploce Square to Pile Square to finish our beautiful tour, and return to the ship for lunch. Thank you for stopping by to catch a snippet or two of the sights of Dubrovnik along the Adriatic Sea, and viewing the beautiful world as seen thru my eyes. I am joining Susan @ A Southern Daydreamer for Outdoor Wednesday. I am also joining Vanessa @ Southern in my Heart for Inspiration Friday. Labels: Croatia, Oh the PLACES I've been! Back when my husband was living, we went on a number of cruises. To us that was the best way to go. I have not been in awhile. They were experiencing so many problems, I decided to hold off. We never were in this place. Looks like a fun place to visit. Have a great vacation - looks like a nice place to visit! The photo mosaic was a great idea for posting all those wonderful photos. My husband and I just celebrated our 18th anniversary with a cruise, allbeit our own boat and a much shorter journey to the San Juan Islands. We, too, have two sons and a daughter- not grown yet. Thanks so much for sharing your holiday with us. What a fabulous trip! Those photos are gorgeous and I feel like I just went on a little adventure myself just reading your post! Thanks so much for linking up with my "Inspiration Friday" party and I look forward to seeing much more from you in the future! What a wonderful looking place to visit! I love the folk costumes and colors and just the sights in general. What a gorgeous port of call! You must have been entralled. Arn't the people in their national dress exquisite? It must have been the most fabulous day. I would love to learn more about Dubovnik!